Dr. Tahmooressi provides spinal corrections using gentle chiropractic techniques. Significant advancements in chiropractic services have been made, and our Hendersonville, NC office makes sure to stay up-to-date. The newest spinal correction methods we offer are safer, more comfortable to patients, and more effective than ever before. Dr. Tahmooressi will happily provide resources and talk through details of any treatment she performs! Spinal traction is a form of decompression therapy that relieves pressure on the spine and nerve roots to help promote disc healing. Spinal traction is used to treat herniated discs, sciatica, degenerative disc disease, pinched nerves, headaches and many other back and neck conditions by creating space between the spinal disc and vertebrae. This conservative method of treatment feels great and has very few risks or potential side effects. This is all about soft tissue work and the use of stainless steel instruments to help increase the function and blood flow to the muscle being affected. Muscles and tendons can develop inflammation during activities, acute trauma, overuse and even just repetitive stress. The strategic scraping of the tool over these areas helps to release fibrosis of the soft tissue and speed healing. This technique is used by Chiropractors, therapists and even athletic trainers on athlete specific injuries, but is great for everyday injuries as well. It is not uncommon to experience some discoloration in the treated area, so don't be alarmed if later you notice some bruising color. ART is actually a combination of examination and treatment. Dr. Andrea Tahmooressi uses her hands to evaluate the texture, tightness and movement of muscles, fascia, tendons, ligaments and nerves. Abnormal tissues are treated by combining precisely directed tension with very specific patient movements. Dr. Andrea Tahmooressi received her Webster Technique certification for treating pregnant women through the ICPA. The Webster Technique is a specific chiropractic analysis and diversified adjustment. The goal of the adjustment is to improve SI joint and sacrum function, improving the biomechanics of the pelvis. Chiropractic care during pregnancy has been proven to help decrease sciatica, low back pain, breech presentation, round ligament pain, rib pain and heartburn during pregnancy. Interferential stimulation is an effective treatment option to relieve pain and accelerate the self-healing process, getting your body back to a healthy, pain free state. Using skin-contact electrodes, high frequency signals in an IFC device penetrate through the skin into muscle tissues, reaching deeper lying areas than other techniques. Interferential stimulation is also extremely useful in reducing pain, inflammation and spasms. Reduces or eliminates your pain safely. Noticeable decrease in swelling and inflammation. Restores lost movement and improves restricted movements and coordination. Stimulates the natural hormones which can help your body heal faster. Kinesio Taping is a rehabilitative technique designed to facilitate your body’s natural healing process. The tape itself provides support and stability to muscles and joints without restricting your range of motion. 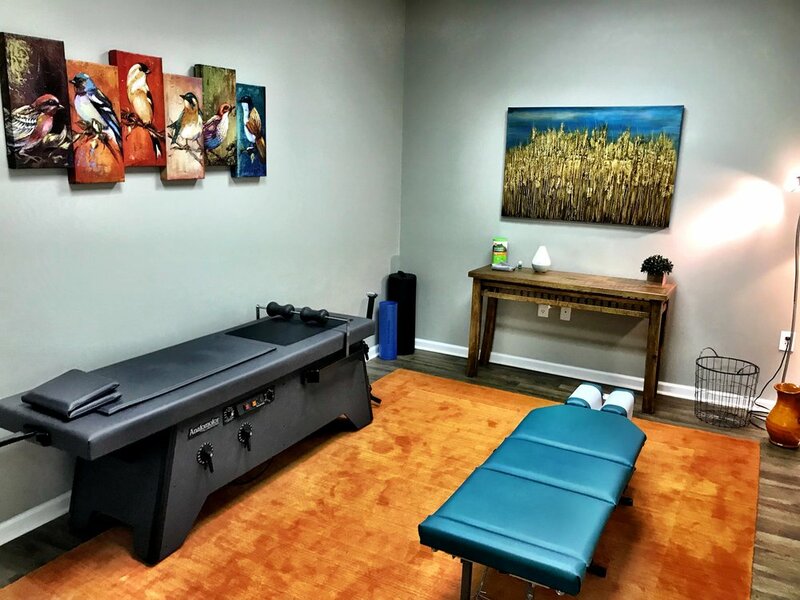 In addition, it provides extended soft tissue manipulation to prolong the benefits of manual therapy administered within our Hendersonville chiropractic office. We often find that patients don't realize certain activities can aggravate or even cause the pain and discomfort they are experiencing. So all of our treatment plans include lifestyle advice to ensure patients can stay active in their favorite activities by confirming proper positioning and movement safety. Did you know nutrition is the single most important factor in overall wellness? Our Hendersonville chiropractic office educates patients on beneficial vitamins and supplements, and makes recommendations when appropriate. Certain combinations of supplements can actually counteract their individual benefits, so it is important to use them properly! At Grace Chiropractic, we are proud to provide the finest chiropractic wellness care to all of our Asheville area patients.